Arts & Crafts Materials for Kids! Items not collected/received by 8 March 2019 will be forfeited and no refund will be given. Let your toddlers and little ones be creative and have fun in the process of growing up too! With these sponges, felts, brushes and activity books, your kids will never be bored and instead will be happy exploring the world of colors, figures and animals! Up to 63% off fun with toddlers! Founded in 2010, Play and Learn is a fast growing company in the State of Qatar offering its outstanding services to Nurseries, Kindergartens, Schools, Hotel, Restaurants, Residential Compounds and Family Homes. We excel in providing educational supplies, toys, furniture for classrooms & libraries, indoor & outdoor play equipment, indoor floor & wall mats, outdoor & indoor traversing wall, artificial turf and rubber tiles. 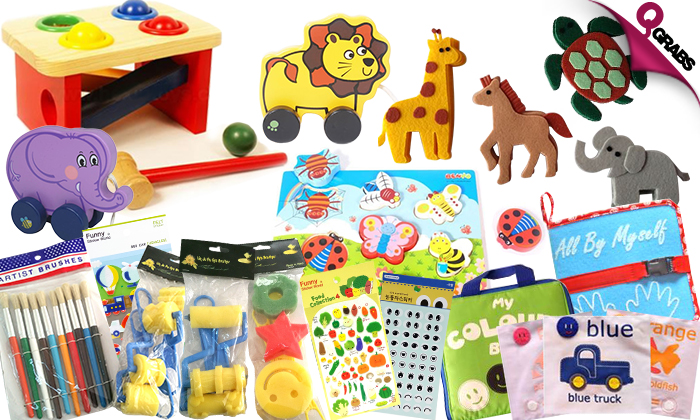 Play and Learn offers high quality resources (many of them exclusive) and provide valuable guidance to the best way they can be used to support a child’s individual strength, interest and need. We at Play and Learn understand the importance of inspiring young minds through education. We aim to achieve this by offering high quality products and services, in a timely, safe, reliable and an environmentally friendly manner. Willingness to take on new challenges and see them through is our hallmark, because we know, that challenges are the steps of the ladder that take us higher and higher. When quality and trust are the benchmarks of a good working philosophy, “Play and Learn” is well above its competitors by providing excellent customer service and prompt delivery. To achieve this Play and Learn has been giving consistent support and motivation to its well qualified and dedicated work force. Complete setting up of Nurseries and Kindergartens. Installation of wooden and steel furniture. Installation of indoor/ outdoor traversing walls. Installation of indoor/ outdoor play equipment. Installation of indoor floor & wall tiles and mats. Installation of artificial turf and rubber tiles. Installation of finger protection, corner protection and pole protection. Themed painting of indoor and outdoor walls. Cut out pieces of felt on shape of vegetables. Spare squares are 6 of each color and the numbers of the cut out shapes are 7 for each of the shapes. Cut out pieces of felt on shape of fruits. Spare squares are 6 of each color and the numbers of the cut out shapes are 7 for each of the shapes. Two sheets of gold rimmed hearts (for you & thank you) and one sheet of thank you seals. One sheet of soft vehicles, transportation and one of vehicles and road signs! One sheet of dinosaurs, one of beetles and one of fishes! One sheet of strawberries, one of flowers and one of vegetables! Cut out pieces of felt on shape of animals. Spare squares are 6 of each color and the numbers of the cut out shapes are 7 for each of the shapes. Cut out pieces of felt on shape of sea animals. Spare squares are 6 of each color and the numbers of the cut out shapes are 7 for each of the shapes. Jumbo cut out pieces of felt on shape of sea animals. Spare squares are 6 of each color and the numbers of the cut out shapes are 7 for each of the shapes.